Lessons of the Bones	University of Utah alum Lindsay Zanno seeks clues to the future in the fossils of the past. Paleontologist and University of Utah alumna Lindsay Zanno spends much of her time out in the field prospecting for dinosaur bones, and this past summer took her to the Mussentuchit Flat area near Cedar Mountain in Utah’s Emery County. It’s difficult work, in a moonscape of drab, barren hills. But that’s where you find dinosaur remains, and Zanno hit pay dirt with a new discovery the same way she always does: by looking down. 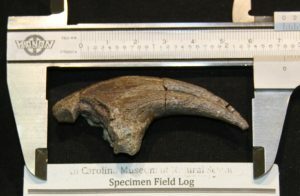 This //Falcarius utahensis// claw was among the finds during Lindsay Zanno’s 2012 fieldwork in central Utah. Zanno’s team collected what they could and tagged the area for excavation, which they’ll go back to do in 2013, in a process that can take a couple of years before the new species is named and its significance assessed. Then it will go into the database Zanno has been amassing for years, to help fill out an ancient family tree of feathered dinosaurs that stretches from hundreds of millions of years ago to present-day bird species. It’s work that suits her, because Zanno has always been fascinated with ancient history. As a paleontologist, Zanno splits her time between work in the field and work in her lab, hunched over a microscope examining fossils, or crunching numbers. She also holds forth to visitors at the North Carolina Museum of Sciences’ Nature Research Center, explaining scientific findings in layman’s terms. Zanno, a research assistant professor at North Carolina State University, in Raleigh, is director of the Nature Research Center’s paleontology and geology lab, which has a fossilized skeleton of a young Tyrannosaurus rex standing guard outside the door. Zanno grew up in a single-parent family in Norbrook, New York. Her parents divorced when she was 3, and her mother, Sally, worked the night shift as a nurse. So Zanno had long stretches of time alone as a kid, developing a streak of curiosity and inquisitiveness. She liked being outside, taking things apart and putting them back together. When it came time to choose a college, Zanno knew she wanted to get out into the world. So she opened up a road atlas to a random page and wound up at the one for New Mexico. That led her to the University of New Mexico. At New Mexico, Zanno started out studying human evolution. Then she did an internship with a grad student named Andrew Heckert (now an associate professor at Appalachian State University), who was doing a dissertation on microsorting fossils under microscopes. That resonated with Zanno’s obsession with ancient times, inspiring her to shift the focus of her studies farther back in geologic time. She changed to dinosaur paleontology and came to the University of Utah to study with then-new curator of paleontology Scott Sampson for her graduate work. With Sampson serving as her advisor, Zanno received master’s and doctoral degrees in geology. Along with fieldwork unearthing fossils, Zanno’s other formative experience at Utah was working as a resident graduate student at the old Utah Museum of Natural History, which gave her numerous opportunities to interact with the public. One of Zanno’s earliest efforts at making science more accessible to the public was a children’s book she wrote while at Utah, The Fall Ball (2005, BookSurge Publishing). Zanno wrote the book, and her sister, Kristine Zanno-Kratky, illustrated it. They did it as a tribute to their mother, who died of breast cancer in 2000. 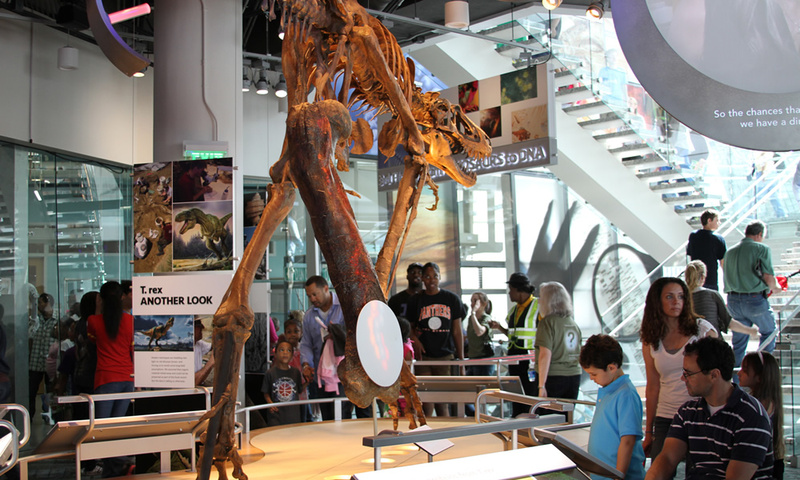 Visitors view a dinosaur display at the North Carolina Museum of Sciences’ Nature Research Center. “Here” would be the Nature Research Center, Zanno’s professional address for the past year. Before that, she did stints as a research associate at Chicago’s Field Museum and as an assistant professor of anatomy at the University of Wisconsin-Parkside. But the Nature Research Center job offered special allure for Zanno, thanks to its mission of demystifying science and involving the public in the process as much as possible through “citizen science” initiatives. She moved to Raleigh with her husband— fellow U alum Terry Gates MS’04 PhD’07, a postdoctoral fellow in paleontology at Ohio University—and their two young daughters in time for the museum’s opening in April 2012. Zanno is one of four lab directors at the Nature Research Center and oversees a staff of six researchers and graduate students. Her job involves as much communication about science as hands-on research. The museum’s research work takes place in an atmosphere of transparency, with a mantra of, “How do we know what we know?” You can watch the scientists at work through the glass, and the public is frequently invited into the labs to take part and talk to scientists about the work. As part of its goal to make science more appealing to lay people, the Nature Research Center envisions and presents its four directors as “rock stars”—visible personalities, and the institution’s faces. Each of the Nature Research Center’s labs is in charge of public outreach programming for one day every week, and Zanno’s paleontology and geology lab handles Tuesdays. Most Tuesdays, you’ll find Zanno presenting her findings in the museum’s Daily Planet multimedia theater, either in-person or via satellite from the field. Margaret Lowman, the Nature Research Center director who hired Zanno, calls her a rising star. The outreach aspect of the job is perfect for Zanno, who has always put a high value on making science appealing to the general public. But the science profession hasn’t always seen the need for accessibility. Scientists have at times thought that explaining themselves and their work was beneath them. 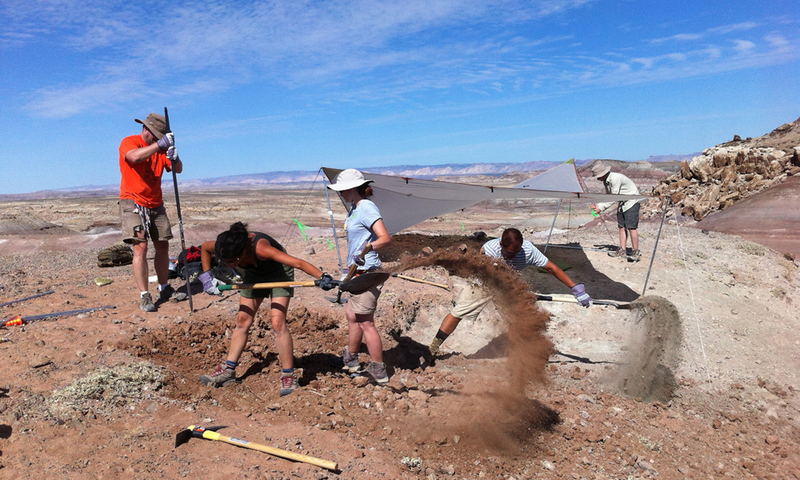 U alumna Lindsay Zanno, second from left, digs for fossils in Utah during the summer of 2012. A common question people ask Zanno is how she knows where to find dinosaur fossils, and the answer is simple: in places where there aren’t too many plants. For example, there’s the Crystal Geyser Quarry, one of her research outposts, in Utah’s Grand County. Zanno and her crews regularly go there to unearth fossils from a “mass death assemblage” of Falcarius utahensis, a plant-eating dinosaur from the Cretaceous era, bringing the specimens back to North Carolina to pore over them in the lab. Originally discovered in 1999, the Crystal Geyser Quarry cache is a hillside with a layer of fossilized bones about one meter thick. There are several hundred bones per square meter, from newborn dinosaurs to elderly specimens, and they’ve yielded up a veritable gold mine of information about growth curves and how that rate changed over time. Fossil records are usually just fragments that give researchers clues, and it’s very rare to find so many individuals of one species in the same place, as Zanno and the other paleontologists have done at Crystal Geyser. But there are still some sample gaps for Falcarius utahensis; Zanno is hoping to find more of the skull, for example. Maybe that will shed light on how these dinosaurs died, which is where the practical modern-day value of Zanno’s work comes in. You could say Zanno is going back to the future here, trying to understand how dinosaurs responded to environmental changes similar to those happening today as the earth’s climate becomes warmer and dryer. Some people may debate about the reasons for climate change, but the way Zanno sees it, whether mankind is causing climate change is irrelevant. Whatever the causes, its potential consequences are ominous. To that end, you’ll find Zanno spending summers at various dig sites for the foreseeable future, and the rest of the year trying to put it all together. The future is unknown, but the best way to predict it might be to look at the distant past. —David Menconi is a features reporter for The News & Observer in Raleigh, North Carolina. His freelance writing has appeared in publications including The New York Times and Salon.com. His book Ryan Adams: Losering, A Story of Whiskeytown was published by University of Texas press in September.